Minnesota Gov. Mark Dayton has appointed Lt. Gov. 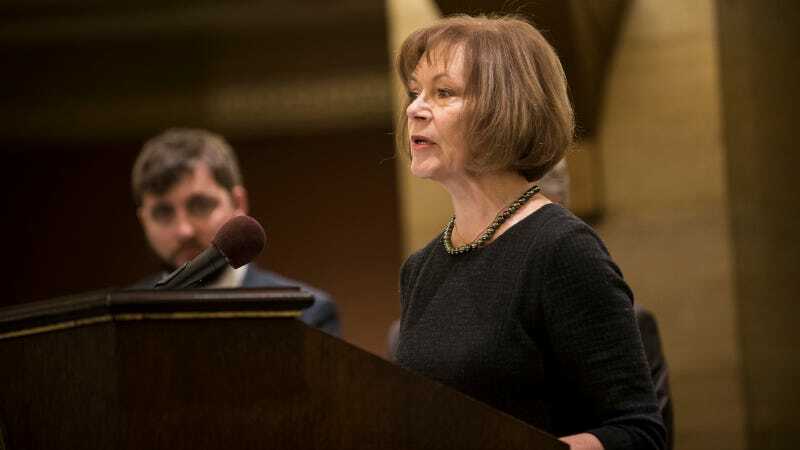 Tina Smith to fill Al Franken’s soon-to-be-vacant seat. Smith, a former political operative who was also VP for public affairs at Planned Parenthood Minnesota, announced that she plans to run for her seat in the 2018 special election, a shift from earlier reports that she would just be a placeholder. Her appointment means that she and Sen. Amy Klobuchar will be the first pair of women senators in Minnesota’s history, which feels appropriate, doesn’t it? MinnPost has a good primer on Smith that emphasizes her apparently wonderful interpersonal skills, which Dayton’s speech reflected. She also addressed fears that progressive Minnesotans would resent a pre-selected 2018 candidate. 2018 will be an election year for both of Minnesota’s Senate seats and the governorship, an opportunity that Republicans are heavily eyeing in a state that only went to Clinton last year by two percentage points (then again, they just lost in Alabama, so).